A very tragic news has been surfaced, revealing the loss of yet another gem in the computer industry. Dennis Ritchie, the founder of ‘C’ and Unix Operating system, and Ian Murdock, founder of Debian Linux and creator of apt-get, has always been stated as two faces of the same coin. The tragic loss of these great individuals in the programming world is bewailed and the reason for extended sadness in Linux community. The Docker Blog first put this news on the internet, which was then picked up by many communities worldwide as a shocking information. The death of Ian is questionable, as it appears to be a suicide. Ian claimed that he was involved in some police case and has been beaten by police while in custody. 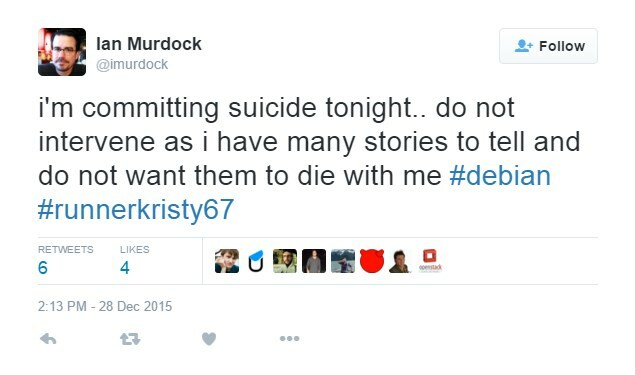 He later tweeted on Monday night that he would commit suicide. The followers of Ian Murdock on twitter assumed that his account was hacked, and no one actually believed that he would commit such action. Ian’s twitter account has since been deleted. Public records indicate Murdock was arrested on December 27, and released on bail by the San Francisco County Sheriff’s Department, but no details were available on the charges. The cause of the death is still unclear. Ian Murdock is responsible for forging one of the first Linux distros, a successor of Unix. Ian’s work has included many other parts of the free and open source community, including his role as CTO of the Linux Foundation, a lead of Project Indiana at +Sun, and a recent addition to the Docker team – among many other positions and achievements. As you all know I use Ubuntu, an open source Linux distros based on Debian, on all my computers; however, Debian (2.2 “woody” to be exact) was my first experience on Linux which made me switch from Windows XP and allowed me to dwell into this amazing world. It isn’t a surprise that I have some sentimental values for the Debian community. I followed Ian’s work very closely and have been a huge admirer.